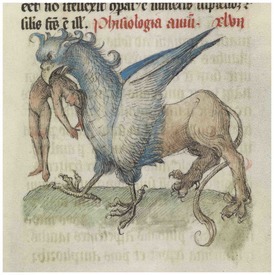 Los Angeles — Unicorns, lions, and griffins race, tumble, and soar through the pages of bestiaries - the medieval book of beasts. The bestiary brought creatures - both real and fantastic - to life before a reader’s eyes, offering both devotional inspiration and literary enjoyment. A kind of encyclopedia of animals, the bestiary was among the most popular illuminated texts in northern Europe, especially in England, during the Middle Ages (about 500-1500). On view at the J. Paul Getty Museum May 14 through August 18, 2019, Book of Beasts: The Bestiary in the Medieval World explores for the first time in a major museum exhibition the bestiary and its widespread influence on medieval art and culture. The exhibition is generously supported by The Leonetti/O'Connell Family Foundation, The Ruddock Foundation for the Arts, Jeffrey P. Cunard, and Elizabeth and Mark S. Siegel. Additional support is provided by Allen Adler and Frances Beatty, Ariane David on behalf of the Ernest Lieblich Foundation, the J. Paul Getty Museum Director’s Council, Dar and Geri Reedy, Virginia Schirrmeister, and Brian and Kathy Stokes.